Click the Edit Player button at the bottom left of your screen. At a minimum, enter first and last name and gender. Under normal circumstances an ID number is not required. The player’s ID number is used ONLY when transferring golfers between other Software Systems for Golf’s programs. If you are transferring golfers to the Tournament Manager or from the Handicap System enter the player’s ID#. 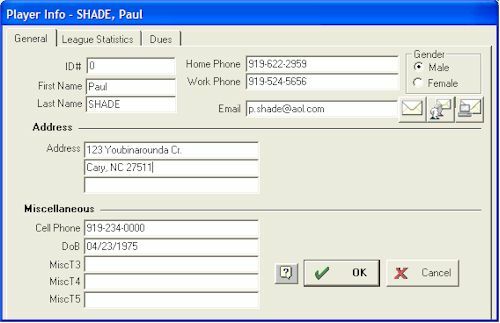 Plan ahead for how you allocate ID#'s so you do not have the same ID# for more than one player. Make sure you enter the correct gender for each player. If you run a mixed league, men and women will play from their designated tees. Rating, slope, hole handicaps, and pars will be used accordingly. Mark if a player will participate in gross and/or net skins. Only players marked to participate in skins will appear in the skins report #5. To mark a player in skins, highlight the player and press F8, or pull up this form and mark the “In skins” option(s). Note: You can mark all players NOT in skins by selecting “Remove ALL players from skins” under the Tools menu. Note: A much faster way to manually reposition players on a team, is to simply drag the “Player Icon” (to the left of each player’s name) and drop it in the position you wish the player to appear. This list displays the player’s information for each event played. The following is displayed…event #, date, inactive, flight, handicap, gross score, adjusted gross score, points, triple bogeys, double bogeys, bogeys, pars, birdies, eagles, etc. Some leagues, usually 5+ players per team, allow only a portion of their team members to play in each event. To mark a player as inactive, highlight the player on the main screen and press F7, or pull up this form and mark “inactive”. An “X” will appear next to the name, indicating he/she is inactive. Then sort the players. Select “Player Pairing” on the Tools menu. Inactive players will appear at the bottom of each team after sorting player positions. Players may be flighted. Flights can be used as a selection parameter (filter) in most individual player reports. For example, you can have two standings reports...one for the A flight, one for the B flight. If for some reason you want a player to have a different handicap than the auto handicap calculation would give him/her, you can type in any handicap for the current event and check the “Lock Handicap” box. Note: This handicap is only locked for the event you are viewing. On the main list the Handicap will appear in RED, to indicate that it has been locked. The following values are automatically totaled from the player’s scorecard…gross score, adjusted gross score, points, pars, birdies, eagles, etc.. If for some reason you wish to alter/override these totals you can check the “Lock Score Card” box and type the gross score, adjusted score, points, pars, birdies, eagles, etc you want the player to receive. League Mamager displays these values in RED to indicate that they were manually entered and locked. Check the “Lock Scorecard”. Click with the mouse. Type the gross score, adjusted score, points, pars, birdies, eagles, etc you want the player to receive. The values will appear in RED and a “L” will appear in the “Team” column of the main list next to the player’s name to indicate that you have locked the points and scores calculated by the score card. Remember: If you mark “Lock Scorecard”, scores will no longer be updated by the scorecard. Only scores entered on the player form will be used. Note: The points that are locked are only points that are given to the individual player. If you are giving points directly to the team you must select the Team form to lock team points. See Entering Team Information for more information. This list displays all the scores used to calculate the current handicap. 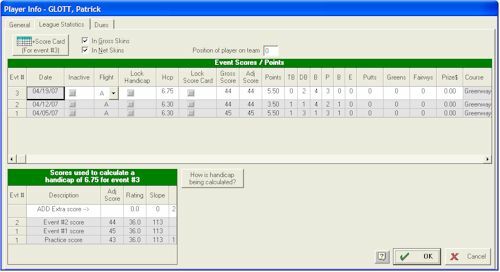 All event scores, practice scores, and NON-event scores used to calculate a handicap are displayed. If you have a question about how a handicap is being calculated click the How is handicap being calculated button. League Manager will show step by step how the handicap was calculated. If your membership has played practice rounds, or you have a history of scores for your players, enter these while viewing event #1. Practice scores allow you to immediately establish an initial handicap for event number one. The more practice scores you enter, the larger sample of scores to select from, and the more stable the handicap will be for the first few events. Click in the “Adj Score” box. Type the Adjusted Gross Score and press ENTER. Type the Rating and press ENTER. Type the Slope and press ENTER. Divide the existing 18 hole course rating by 2 and enter for front and back ratings. A rating is basically what a scratch golfer shoots and is usually around 36. The slope is not required. If you do not enter a slope, 113 will be entered automatically. This is the slope used for an un-sloped course. Note: If you are running a 9-hole league and entering 9 hole scores do NOT divide the slope by 2, enter the same slope as the 18 hole course. Scores are assumed to be entered oldest to newest, and are displayed in the list newest at the top, oldest at the bottom. If you do not enter scores in the proper sequence use the Move score UP or Move score DOWN button to put scores in the proper order. When you post a practice / non-event score it is recorded as taking place prior to the current event you are viewing. Scores posted while viewing event #1 are called “Practice scores” and took place prior to event #1. Scores posted after event #1 are called “Non-Event scores”. Example: A “Non-Event Score” posted while viewing event #5 took place before event #5 but after event #4. Practice / Non-event scores only affect a player’s handicap, they do not affect any other statistics. If you do not enter any practice scores, League Manager does have an option to calculate an “Instantaneous Handicap”. See Handicap Calculation Parameters for more information.